Entertaining and accessible, The Adventures of Phatty and Payaso is a fun early chapter book that emphasizes bravery and compassion. 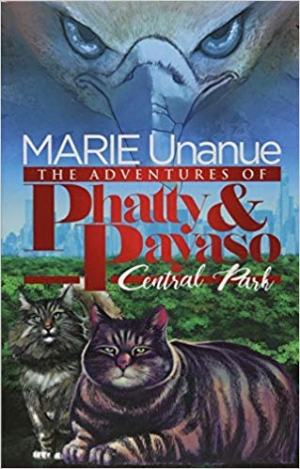 In Marie Unanue’s early reader The Adventures of Phatty and Payaso: Central Park, two cats and their companions go far outside their comfort zones on a mission through Manhattan’s largest park to thwart a bullying bird with criminal intentions. Crawler, a hawk, plans to use the skills he learned as a circus performer to break through Phatty’s balcony windows and steal the tubby tabby’s human mom’s jewelry for a criminally minded friend. Phatty knows that the only thing that can stop the hawk is returning him to the Central Park Zoo, where keepers cared for Crawler after he was injured in a circus act. Though he’s a cowardly cat by nature, Phatty sets off across the park and is soon joined by his fit feline brother Clyde, his dog brother Stanley, and his best friend Payaso. All are on a quest to put Crawler in his place. Along the way, the book fully fleshes out its key characters, including a human helper named Max. The group meets new friends and learns lessons about loyalty, kindness, and the acceptance of others and themselves. Even purposely slapstick scenes, such as the one that chronicles Phatty and Payaso escaping the apartment building disguised as a dog walker in a hat and raincoat, add to the personified animals’ individual character development. The tale’s tour through New York City’s Central Park from a four-legged point of view makes the green space and its animal inhabitants important supporting characters in the story as well. Enchanting illustrations strike an excellent balance between realism and kid-friendly playfulness; they also contribute to the book’s convincing characterizations and its appealing setting, exploring natural wonders that might escape everyday observation. Illustrator Edgardo Miranda-Rodriguez is not directly credited as the illustrator in the book itself. Cleanly laid out and designed, the book’s chapters are well divided and well defined, both in terms of their events and length. Dialogue is natural and includes a smattering of double entendres—involving bird poop, for example—that will be appealing to its target readership. The book’s takeaways are more serious; its characters discover that they are more capable and confident than they ever believed possible, or come to appreciate the value of humility and compassion, even for those who are very different from themselves. Entertaining and accessible, The Adventures of Phatty and Payaso is a fun early chapter book.